Inclusions: Private tour guide, roundtrip private door-to-door transportation, taxes, tolls and parking. 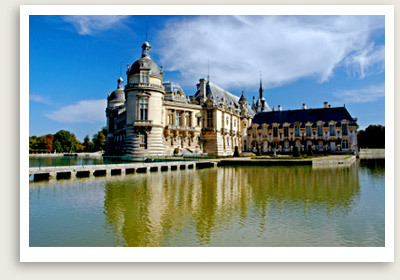 This upscale Chantilly tour from Paris takes you to two beautiful towns just north of Paris. Your day tour from Paris begins with a trip to the lovely town of Chantilly, surrounded by stone Roman ramparts and peaceful woodlands. Chantilly is known as an equestrian town, and you can visit an 1834 racetrack here (thoroughbreds still train here daily) and the nearby “Living Museum of the Horse,” where, indeed, you can watch shows featuring live horses among other equestrian-themed curiosities.